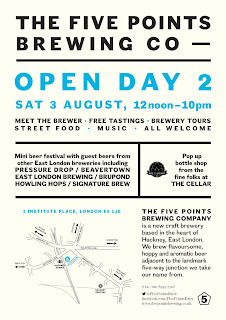 New Craft Brewery Five Points are holding their second open day in Hackney on Saturday 3rd August. Expect the usual things like tours and talks about brewing, and also food including meatball subs, but most of all expect beer! "We will be showcasing our core range of ales--our Five Points Pale, Hook Island Red and our Railway Porter. There will be a special cask of our Hook Island Red that has had some extra hops thrown in the cask, which will be an interesting experiment to compare it with our regular batch. Our beer will be available in cask, keg and in bottle, and people can purchase bottles to take home to enjoy for the rest of the weekend. There will also be a tour of the brewery at 1 pm. We will also feature a selection of guest ales from fellow East London microbrewers: Beavertown Brewery, Signature Brew, Howling Hops, Pressure Drop, East London Brewing Company and Brüpond. It will be a mini-beer festival of East London beer. There will also be a pop-up bottle shop of foreign beers curated by our friend Johann at The Cellar. 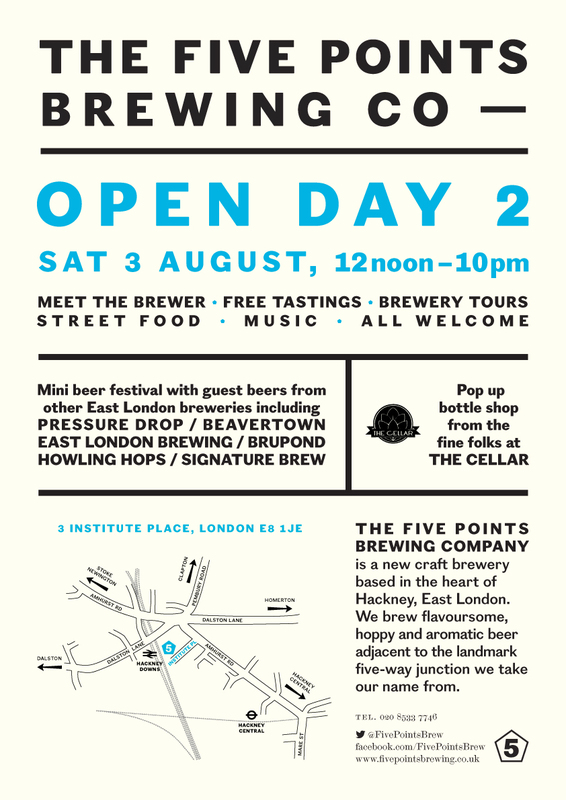 At our last Open Day, he brought beer from the single-hop Mikkeller IPA series, which we expect he will return with this time to the thrill of East London beer geeks. Food is available with street food vendors Capish and Song's Kitchen. Capish will be providing Italian-American food including meatball subs and sliders, while Song's Kitchen will have an array of Asian-inspired treats--summer rolls, gyoza and salads. Considering the weather, we've also booked in Icy Freshpops for their cold confections."